As women, we know how important it is to take charge of our health care-to be informed and proactive. But too often we forget that our mental wellness is an integral part of our overall health. The Complete Guide to Mental Health for Women is the definitive resource for women looking for answers to their mental health questions, whether those questions concern a disorder like depression or adjusting to major life changes like motherhood or divorce. 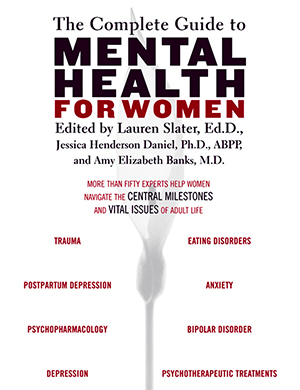 Drawing on the latest thinking in psychiatry and psychology, written for women of diverse backgrounds, The Complete Guide to Mental Health for Women begins with Part One, the life cycle, helping women understand the major issues and biological changes associated with young adulthood, middle age, and old age. Specific entries address the psychological importance of women’s sexuality, relationships, motherhood, childlessness, trauma, and illness and discuss how social contexts, such as poverty and racism, inevitably affect mental health. Part Two explores specific mental disorders, including those, like postpartum depression, related to times when women are particularly vulnerable to mental illness. Part Three takes a closer look at biological treatments-including the use of antidepressants, and various types of psychotherapy-from cognitive behavioral treatments to EMDR and beyond. The Complete Guide to Mental Health for Women ends with a section on life enhancements-because the activities that help us live fuller, more vital lives are also essential to our mental health. Aging. What should I expect from menopause? What do I need to know about the benefits and risks of hormone therapy? Pregnancy. How will becoming a mother change me? How do I overcome postpartum depression? Childlessness. What if I don’t want to be a mother? Sexuality. Is a “female Viagra” the solution to women’s sexual complaints? How does societal ambivalence about women’s sexuality affect me? Body Image and Eating Disorders. Are all eating disorders a reaction to societal pressures to be thin? Polypharmacy. Why are some patients prescribed more than one type of psychotropic drug? Is this overmedicating? Finding a Psychotherapist. How do I know if a therapist is right for me? And how do I know what type of therapy I need? Anger. Why is it the most difficult emotion for many women to express? EMDR. What exactly is EMDR? Is it a reputable therapy? Depression and Anxiety. What do I need to know about psychopharmaceuticals? Does talk therapy help? Complementary Treatments for Depression and Anxiety. Does St. John’s Wort really work? What else might help?